Using a camo face mask greatly improves your odds of success with big bucks. To minimize the effect my personal odors might have on downwind whitetails, I wash all my hunting clothes (including boot liners) with scent-free laundry soap and then hang everything outside to dry (I wear no hunting clothing that cannot be washed in water). Today it is easy to find relatively inexpensive laundry detergents that are free of odors and dyes (color brighteners), Tide-free, for example. Another effective and inexpensive way to eliminate or minimize odors in hunting clothing is to wash it in clear water with soda added (1/2 cup per load). After rinsing twice, hang your clothing outside to dry. I prefer to leave my clothing hanging on our backyard clothesline for four days, time depending on the weather. After completely dry, I fold and stuff everything in odor-free (also washed if necessary) plastic bags, tightly tying the bags closed with rope. 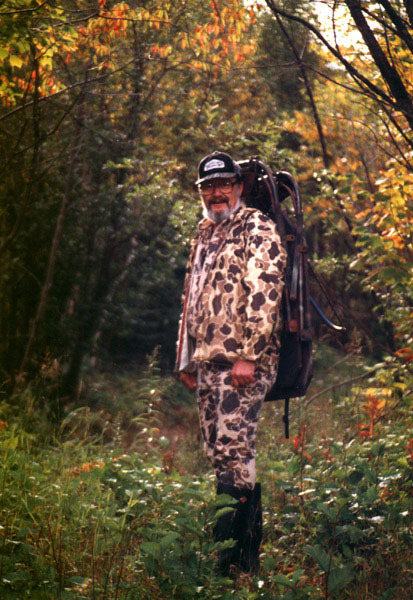 Upon arriving in camp at the end of each day of hunting, I remove my outer hunting clothes (I change underwear and socks daily), put on so-called "camp clothes" and hang my hunting clothes in the back of my pickup where they will not be contaminated by cooking odors or smoke from our woodstove. No less than one week before the opener, I waterproof my packs with Mink Oil and hang them (liners removed) in our back porch to air out until it is time to head to deer camp. Sit, don't stand, at ground level using natural elevations where available, or use an elevated stand platform. Sit only where you have a solid natural background that prevents sky-lighting or snow-lighting. Some natural cover in front is also recommended. 3. Especially when hunting an experienced adult buck, change stand sites once or twice daily. With or without the hunter's knowledge, these deer quickly discover stand sites used by humans, after which they easily avoid them throughout the balance of the hunting season. Changing stand sites once or twice daily makes it difficult for even the most cunning of bucks to continuously avoid the hunter. 4. Make it a rule to sit downwind or crosswind of very fresh deer tracks and/or droppings. Whitetails frequently change the areas and trails they frequent, especially during hunting seasons. Very fresh tracks and droppings reveal where deer are right now, today. 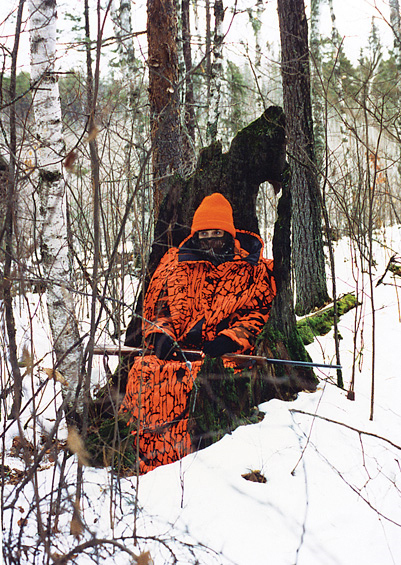 Hunting anywhere else is likely to be a waste of valuable hunting time. 5. Get to stand sites before first light in the morning. The most productive hour of the day to hunt whitetails is the first legal hour of the day. Don't waste one minute of it. 6. Eliminate or minimize telltale sounds. Make certain nothing you carry while afoot squeaks, rattles or jingles. Don't speak out loud, sneeze or cough. Don't drive a motorized vehicle to within 1/2-mile of a stand site. When on foot, walk properly. Bend your knees with each step, raising each foot clear of the ground (no heel dragging) and then putting it down lightly (no heavy footsteps). While traveling to or from a stand site, walk at a moderate, non-stop pace. Frequent stopsmaking audible footsteps interrupted by short periods of silenceare alarming to listening whitetails. Non-stop walking is not. 7. While hiking in the dark, use a flashlight but keep the beam pointed at the ground a few feet ahead. Never point your beam far ahead, parallel to the ground. This makes it easy for whitetails to spot the beam great distances away. Today's experienced adult deer know exactly what the beam of a flashlight means: "Here comes a human hunter!" Turn your flashlight off when nearing your stand site. Halt and allow your eyes to adjust to darkness before proceeding further. After using a cap-light with green light bulbs during the past three hunting seasons, I am now convinced that most, if not all experienced whitetails consider such lights to be harmless. Perhaps it's because they are the same color as the glowing part of fireflies frequently seen by deer at night during summer. 8. Avoid walking downwind except while departing from a stand site. While moving toward a stand site, always move into the wind or crosswind. No matter what you do to try to eliminate odors, never believe you are completely free of telltale odors. To determine the truth of this matter, any time you believe you are completely free of telltale odors, sniff one of your boot soles. If rubber, it will smell strongly of rubber. If leather, it will smell strongly of leather. Then sniff your riflelots of odor there. Then ask one of your partners to sniff your breath (mouth open). Wow. A whitetail's nose is infinitely more sensitive than a human's nose. Those airborne odors you and your partner just smelled (a few of many) are easily detected and identified by experienced whitetails 100-200 yards downwind. Remember, too, even when the air seems calm, it's never completely calm. When it seems calm, wet a finger in your mouth and then hold it high. The noticeably cool side of your finger is the side a light breeze is coming from. 9. Wear a camo head net or mask and gloves. Bare human skin contrasts greatly with natural cover, making it easily spotted by whitetails. 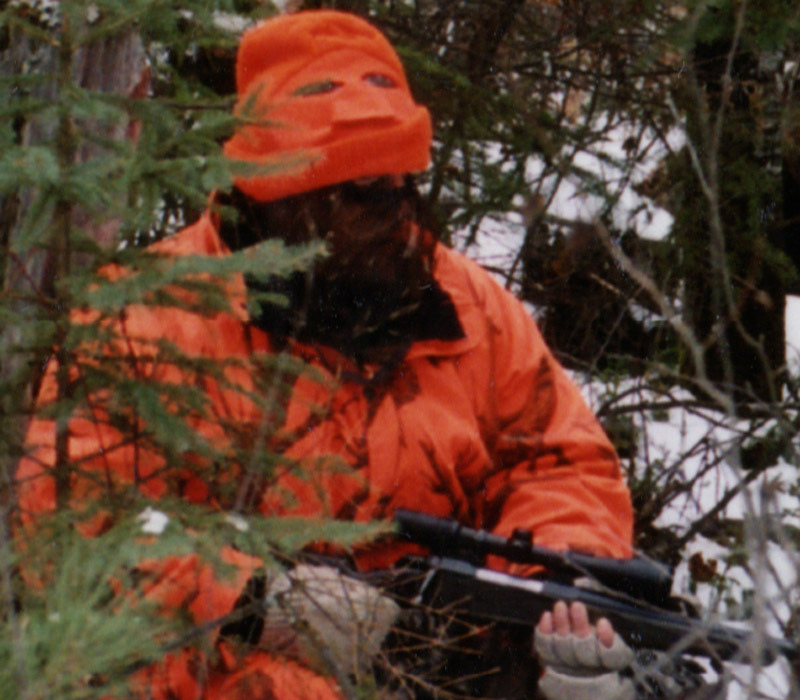 While seated unmoving (before a solid, natural background) and wearing a camo head net or mask and gloves, you will be practically invisible to all whitetails, even to deer only ten yards away. Notice John's barely visible eyes, just under the edge of the blaze-orange ski-mask style hat worn over his camo mask. 10. Key on feeding areas. Except while it is very windy or stormy, whitetails feed twice daily (sometimes three times daily). While feedinga very predictable activitywhitetails are most visible and most vulnerable to skilled hunting. Beginning the second week in November (in Minnesota), forest whitetails switch from eating grasses and such to browse, woody stems of various shrubs and young trees. 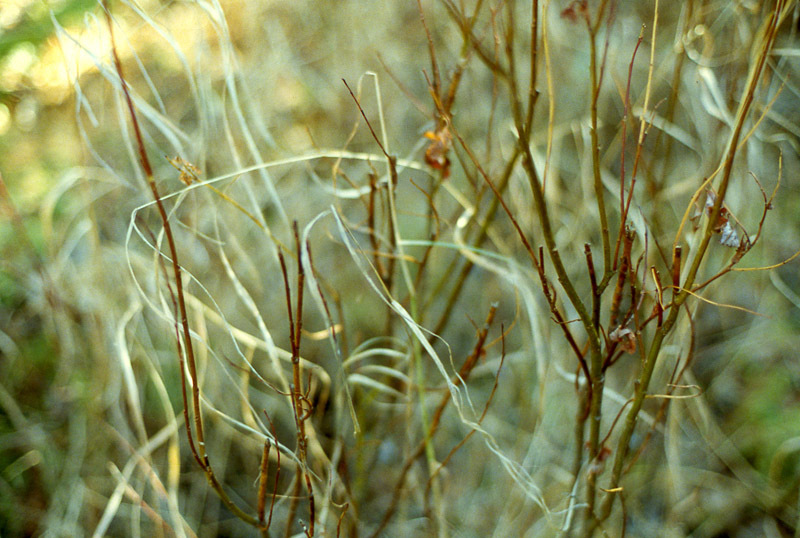 Favorite browse plants are most abundant around edges or within wet lowlands. An example of Whitetail Browse. On your hunting map, make outlines of traditional Browse Areas. Ask yourself, "How will I approach these feeding areas?" 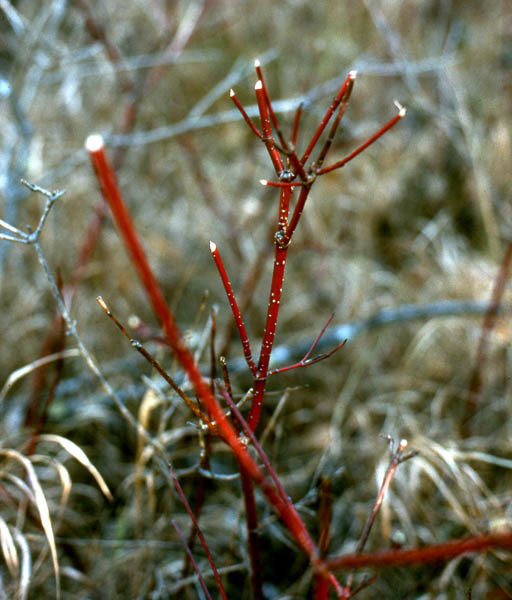 Currently favored browse areas will be full of off-trail deer tracks and droppings and stems of favorite browse plants will have lots of white, nipped-off tips. Don't overlook stands of oaks. Where acorns are on the ground (any kind), you've discovered a likely hotspot. Approach feeding areas from downwind in the morning and from crosswind in the afternoonnever cross a feeding area to get to a stand site. Dr. Nordberg's currently available books, Whitetail Hunter's Almanac, 3rd, 4th, 5th, 8th and 9th Edition, provide all the in-depth instruction you need to become a regularly successful buck hunter. His Buck and Bear Hunting School DVDs, rich with buck and bear photography, 18 hours devoted to adult buck hunting instruction and four hours devoted to trophy-class black bear hunting instruction put you in his wilderness classroom and the forest where he and his sons and grandchildren hunt bucks and bears today.